Hulk smash “Lost In Space,” “Gladiator,” and “Braveheart” into big story with messianic themes starring Hulk. 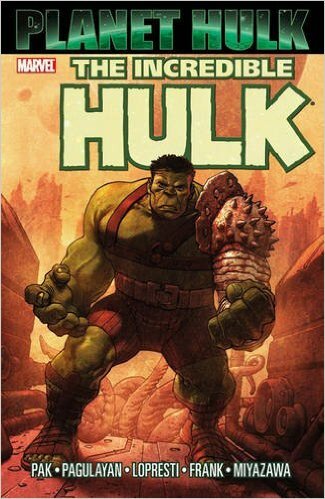 I first read the “Planet Hulk” graphic novel series a few years ago, about the time when the large trade paperback reached the used book stores and became affordable. I thought about doing a review of it not so long ago, then came up with the title for the review. Now, I just need to make a review that can live up to that title. Here’s a summary of the story. The Hulk as been tricked into a rocket ship and shot away from Earth. He ends up on a harsh and hostile planet named Sakaar, ruled by a tyrant called The Red King. On this planet, The Hulk becomes a gladiator, then a symbol and reluctant fighter for freedom, and finally the king of the planet. Spoiler: The comic series ends on a tragic note, with the destruction of Sakaar and The Hulk preparing to return to Earth to bring the pain to the ones who tricked him into exile. I can remember the old Bill Bixby and Lou Ferrigno series from my childhood, and remember how those stories would usually go. It was mostly about Banner getting into some kind of trouble, getting beat up, and two or three times an episode he’d become The Hulk and throw some bad guys around, roar a few times while flexing his muscles, and that’s how the conflict is resolved. In Planet Hulk, we get Hulk, and lots of Hulk. Banner appears only a few times, and only briefly. The reason given is that Sakaar is such a harsh place that Banner wouldn’t last very long, so he has to constantly stay in Hulk form. And this isn’t the “Hulk keep calling himself Hulk all the time, because that’s how Hulk speak” Hulk. The Hulk here is intelligent, speaks normally, and does more to solve problems then simply smash everything in sight. By the time he becomes the king of the planet, he’s introspective and complex, cares about the people who are now under his rule, and is even willing to help an alien species that he’s formerly considered enemies. Not to mention that he’s found love. Yes, there is romance in this story, too. But this is still a Hulk story, so there is still plenty of smashing. One of the interesting aspects to this story is the messianic aspect. There is a religious or spiritual aspect to some of the denizens of Sakaar, that they are longing for the coming of someone they call the Sakaarson. Details are sketchy about this Sakaarson, but it’s basically a savior or messiah figure for the people of this planet, and it looks like The Hulk might well be this figure. Some of the speeches in the boxes seem like prayers to this Sakaarson. And in the animated movie adaptation of the comic, the first scenes we see on Sakaar are of a priest-like man making a prayer to a divine being that he send the Sakaarson to them. There is also a second aspect to these prophecies, someone or something called The World Breaker, which may or may not be the same person. This comes into play more towards the end, and carries over into the next big Hulk series, World War Hulk. As things have happened, I’ve re-read the series a bit before Christmas, and have begun writing this review at Christmas-time. I guess the irony of reviewing a story about the arrival of a savior to another planet at the time of the celebration of the arrival of our Messiah is pretty obvious. Any attempt to compare The Hulk to Jesus should probably crash-land before it gets more than a few inches off the ground. In a sense, it might be better to compare The Hulk in this story to the savior that most people were expecting when Jesus came. A people suffering from the oppression of a dictator are wanting their god to send someone to come and defeat their enemies, that’s a story that has happened in real life as well as in comic books. That seems to be the kind of savior the Jewish people were wanting, someone who would defeat Rome, who would save their nation and make them strong again. Instead, they got someone who was essentially a nobody, born to a couple of nobodies, and who seemed to have no interest in gaining political power and taking any thrones. He made no call to arms, and didn’t even seem to show disdain towards the oppressive Romans. There were miracles, there were signs, there were His teachings, but about all they did was upset people. And, finally, He dies in a manner that was considered among the worst of ways to die. There was no revolution, there was no political deliverance. Rome was large and in charge before He came, and Rome was large and in charge long after He died. It could be said that the life and death of this real-life Messiah only makes sense if our main problem was not politics, even oppressive politics. “Christ Jesus came into the world to save sinners, of whom I am the chief.”1 We are like hospital patients who do not understand our sickness, and who want the doctor to fix what we think is our problem. And even if the problem we think we have is in reality a serious one, the doctor knows that there is another, far more serious problem. Or to use the Bible’s own language, we were dead in our sins, and Jesus came to this world to save sinners. But while the first advent of Jesus was in a sense a quiet one, there are still teachings in the Bible that His second advent will be very different. I don’t want to get into arguments about different views of the end times, I only want to point out that the Bible indicates that Jesus’ second coming is going to be one of judgment, and even wrath. Our Messiah is not a green monster controlled by his rage. He came the first time to deal with our main problem, our sinfulness. He will come again in judgment. And both of these comings are holy and right. The Jesus who came the first time to sacrifice Himself for our sins will be the same Jesus who will come to judge the world. The Jesus who was born a little nobody and placed in a manger is the same Jesus who is called King of Kings and Lord of Lords, and who will come with a sword and will rule the nations with absolute power. In conclusion, “Planet Hulk” is a very good story, far more complex than one might think a Hulk story would be. The only part I didn’t like about it was the ending, and that’s not so much because it’s not a happy ending, but because of how the tragedy came about. There are things about it that the reader won’t learn about until towards the end of World War Hulk, so I’ll not spoil it here, but there are some improbable elements to how the planet-ending cataclysm was brought about. But outside of that, it was a very satisfying story, and one well worth reading.